You can save an unbelievable amount of time, effort and money with the new confirmation email template from Microsoft. This helpful template downloads in just a few seconds on this page. It’s also available absolutely FREE of charge to all visitors to Template Haven. Don’t waste time crafting confirmation emails again. Use the new confirmation email template from Microsoft and find better ways to maximize your precious time today! The confirmation email template comes in the form of a Microsoft Outlook document. After downloading the zip file for free from this page, opening the confirmation email template will open in Outlook. Before editing, feel free to save an unused template for future use. We have received your resume. Thank you for your interest in [Job Title Here]. 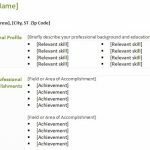 We will forward your resume to departments with openings that match your skills, background, and education. If we find a match, we will contact you to schedule an interview. Otherwise, we will keep your resume on file for one year. 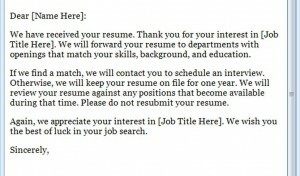 We will review your resume against any positions that become available during that time. Please do not resubmit your resume. Again, we appreciate your interest in [Job Title Here]. We wish you the best of luck in your job search. Before you send the email to prospective employees, be sure you add your own company information in the spaces provided. To do this, simply highlight the information in the brackets, delete it and type your own. You can also add a personal signature to the bottom of the document if you so choose. It’s important that potential employees know their information is being reviewed. 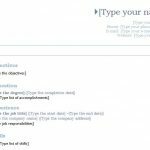 You can eliminate the hassle of informing each and every applicant quickly and easily with the free confirmation email template from TemplateHaven.com!